For Atari and VIC (with or without expansion), this game will challenge anyone's dexterity. If you can score 50 with two balls or 500 with three, there is an extra surprise. "Juggler" is a fast-action game I wrote in September 1981 when the idea of programming BASIC was very new to me. It has undergone countless revisions since then, but the main loop (lines 860-970) remains what it was the first night I struggled. The purpose of Juggler is to use the joystick to control the arms of a cartoon juggler in his attempt to keep two or three balls in the air. 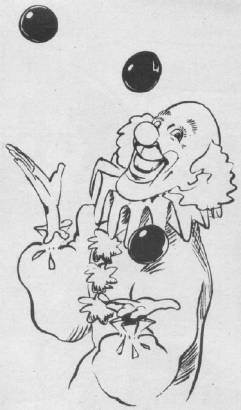 The juggler's hands move in tandem and can be positioned to catch the three colored balls (inside, middle, and outside). Since this game is not for the timid, it requires a joystick because only game addicts know how to work them. The balls are as random as I could make them and, contrary to the opinion of novice players, cannot land at the catching stage at the same time. The most important playing strategy is to make sure you hear the ball being caught before you move the hand toward another catch. The game can be slowed down merely by adding a few extra GOSUB 150 statements in the main loop, preferably at lines 860, 900, and 940. The game will run on either the unexpanded or expanded VIC-20. I would rather not explain how it all works, mainly because it often follows inconsistent logic and layout. One technical footnote for those curious enough to investigate the program: instead of using zeros as values, I used a period (as in Y= .) because I read somewhere that this is faster and still zeros out the variable. To start a game, push the joystick up or left for the three-ball or two-ball games, respectively. To repeat the same game, press the fire-button, or move the stick to change games. If you want to quit, hit Q. 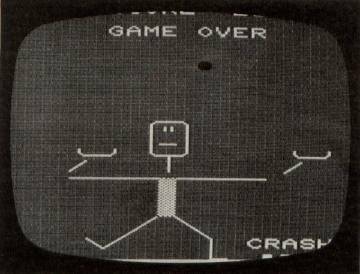 A fumbled ball crashes in "Juggler," VIC-20 version. Use your joystick to move the Juggler's arms to any of three positions (far left, center, or far right) to catch and deflect the balls. You can select a game with either two balls or three balls by pressing SELECT when the game is RUN. If you press OPTION, you can play a "practice" game. In a practice game, you cannot make any points, but you can't lose, either. It's a good way to learn how to play without becoming frustrated. A successful catch is greeted with a "bleep," but a miss gets you a raspberry. If you're not playing a practice game, it's al over when you miss a ball. The rest come tumbling down! A note on strategy: let go of the joystick after each move. This will return the Juggler to the center position, where it is easiest to quickly react. 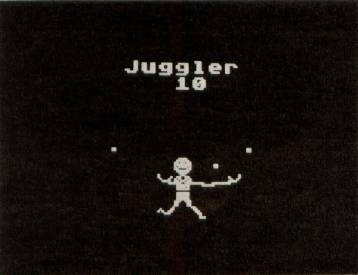 Reaching with an outstretched arm in the Atari version of "Juggler."